If you like travelling around the world and exploring various aspects of human life, Japan can be the place that you cannot afford to miss at any cost. The land of rising sun is said to be the epitome of traditions and culture, history and heritage and science and technology. The Japanese lifestyle is an awesome blend of westernisation and indigenous traditions. Japan has lots of unique things to bestow to the visitors. So, are you planning a vacation in Japan? If yes, you must know about certain exclusive aspects of Japanese culture and day to day lifestyle. By learning about the customs of Japan your trip is guaranteed to be great and memorable. So, do not spend all of the time just looking at the beautiful landscapes and taking snaps, but also spare a few hours of your busy schedule for learning about the customs and lifestyle of the place. Japanese people are quite humble and greet each other and their guests by bowing. They express respect and appreciation to the next person by bending at the level of their waist. This gesture is particularly used to greet “good morning” and “hello, goof afternoon” to the next persons. Bowing also refers to the gesture for apology and gratitude. While bidding adieu, they most frequently use “sayonara” but the world “bye-bye” is also used by many people. Mobile phones have become quite common in Japan, reaching almost to 90 percent population. However, in spite of increasing use of mobile phones, people are expected to follow the etiquettes in public places. Eating habits vary across the boundaries. So, for the tastiest experience of eating foods from other culture, you should know the food habits and customs of the place. Japan has its own meal etiquette and visitors are also expected to follow their customs. The traditional meal format in Japan is the ozen, which is a mealtime table for single person and attached with legs. These tables are placed on the tatami mats on which people sit in seiza position, legs tucked under thighs. However, chairs and tables have become common for dining purposes in Japanese households. 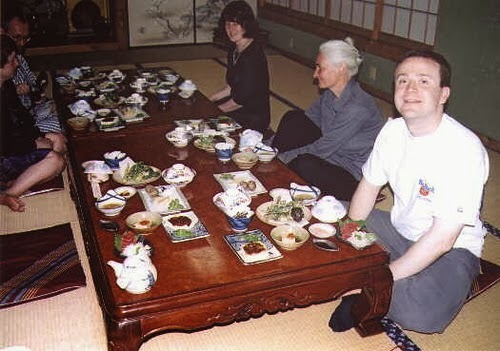 There are many other customs that one requires to follow while eating in Japanese-style dining set-up. Most Japanese foods are eaten with the help of chopsticks, which are made from wood and have a tapered tip. In every household, each family member will have their own bowls and chopsticks. Children use shorter ones, which fit their hands’ size. There are several customs followed at lodging facilities in Japan. You must know of such customs in advance to avoid the feel of embarrassment and surprise. From getting into the bath to the bedding, Japanese people follow different ways for everything. If you are lodging at the hotels or availing services of taxis, restaurants and beauty salons, you are not required to tip the service providers, as everything is included in the bill itself. Another important thing to know is that many traditional homes want you to remove your shoes at the inner entrance of the building and wear room slippers inside the house or room. This is also applicable at traditional ryokan and other Japanese-style lodging accommodations. There are many other customs and traditions that you are expected to follow while holidaying in Japan. Take some time off to know more and more about unique Japanese lifestyle.